Available for the Kindle & iPad, or in Paperback. In this story, Esfandiyar, the designated heir to the throne of Iran, has just returned in triumph from his campaign against the shah of Turan. He has slain Arjasp, Iran’s greatest enemy, captured his family and treasury, and liberated his own sisters from their captivity. He expects that his father, Goshtasp, will now abdicate the throne of Iran in his favor as he had sworn to. Goshtasp, however, is not yet ready to honor his promise. Instead he sets his son yet another task as a condition of his abdication. He must bring Iran’s greatest hero, Rostam, back to the court in chains. Rostam has neither come to the court of Iran to honor Goshtasp, nor has he sent him a letter declaring his loyalty. Esfandiyar recognizes this is simply a means to put his own life at risk, and says as much. Yet he cannot refuse his father’s command. Now is the time to drink delicious wine, When fragrant scents float from the river’s bank. The earth is teeming and the heavens thunder. Happy the man who cheers his heart with drink, Who’s rich in coins, and dainty foods, and well- Filled cups; with sheep to slaughter for his guests. I’ve none of these. Good luck to him who has. May he be generous to those in need. The garden’s filled with roses; hyacinths And tulips cover all the mountain slopes. The nightingale laments throughout the glade While the rosebud preens herself at his distress. Since clouds are sending down their wind and rain, I wonder why narcissus is so sad? The nightingale wakes through the darkest night. He laughs at wind and rain that set the rose To trembling in fear. Snug in his perch Within the rose, he sings his song. Meanwhile The cloud roars like a lion, as though he were The lover, not the rose. Winds tear his robe To shreds. Fires flash within the thunderhead, Fierce proofs of heaven’s passion for the earth- A love it offers here before the sun. Who understands the nightingale’s complaint? Beneath the rose, what is it he laments? Come, listen closely just at dawn, and hear Him sing in Pahlavi* the tale of how Esfandiyâr was slain by brave Rostam, Whose only memory of him is grief. Like the roars of evening thunder, Rostam’s cries Will pierce the lion’s ears and rend his heart. Jerome W. Clinton was born in San Jose, California, in 1937. He studied English and American literature at Stanford (A.B.) and at the University of Pennsylvania (M.A. ), before two years in Iran with the Peace Corps redirected his interest to Persian. He received his Ph.D. in Persian and Arabic literature from the University of Michigan in 1972. Since then he has taught at the University of Minnesota and, since 1974, at Princeton University. Prior to moving to Princeton he directed the Tehran Center of the American Institute of Iranian Studies for two years. Jerome Clinton passed away in December 2003. He has translated The Tragedy of Sohrab and Rostam (Univ. of Washington, 1988) and co-authored a textbook, Modern Persian: Spoken and Written. He has also written a monograph of the eleventh-century Persian poet Manuchehri Damghani, as well as briefer studies and translations from modern and classical Persian. 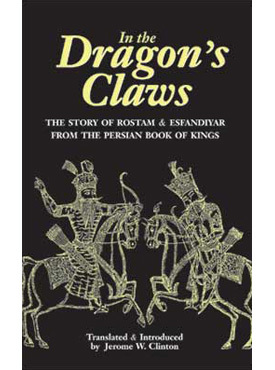 For Mage he has translated In the Dragon’s Claws: The Story of Rostam and Esfandiyar.